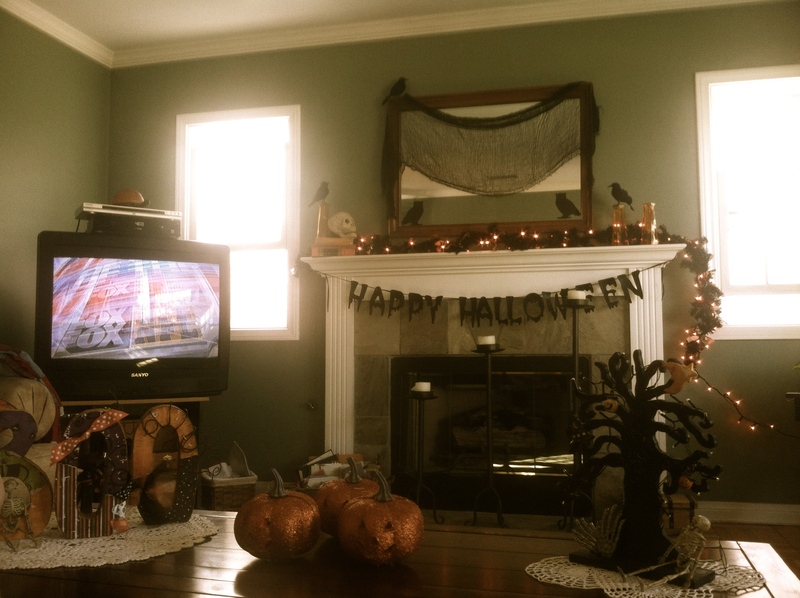 Sunday’s are one of my favorite days, especially during the fall months. The weather gets cooler, its time to pull out the decorations for Halloween, Thanksgiving and Christmas. Football is on so my boys are usually home. And its the day, I designate in trying new recipes. For me cooking is one of my love languages, as well as a creative outlet. I love serving up a large breakfast or a special meal for my family. 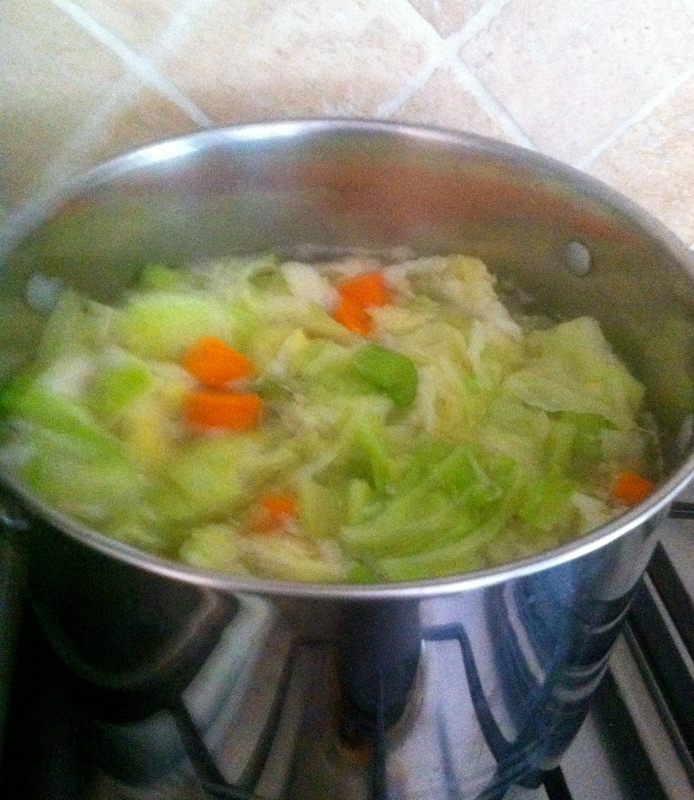 And during the autumn months, I love making soups. All kinds of them. About a month ago, I bought this classic cook book. 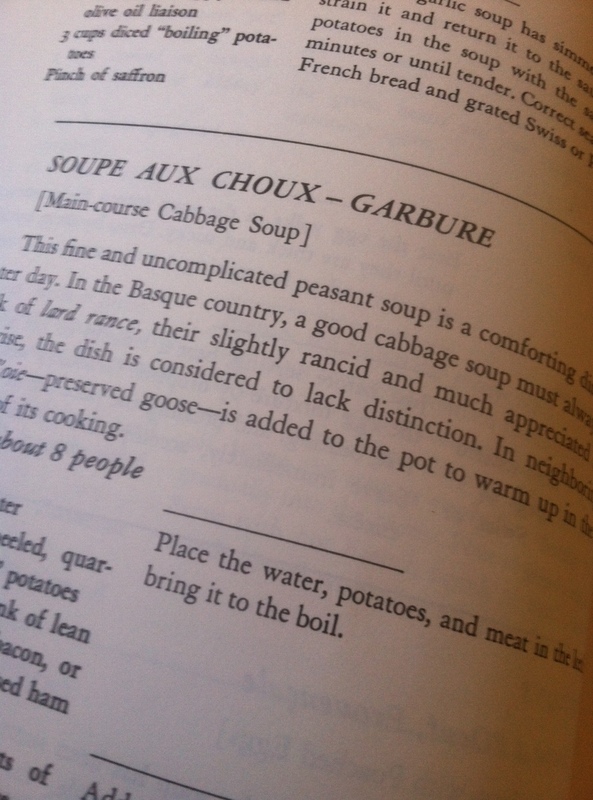 I have been devouring the recipes, deciding what to make first and landed on this one, Soupe Aux Choux-Garbure, otherwise known as Cabbage Soup. Did I mention how much I love soups? Anyways, luckily on this particular Sunday, the weather was cool enough to make this delightful recipe. Sorry for the blurry photo, I think it was the steam coming off the pot. 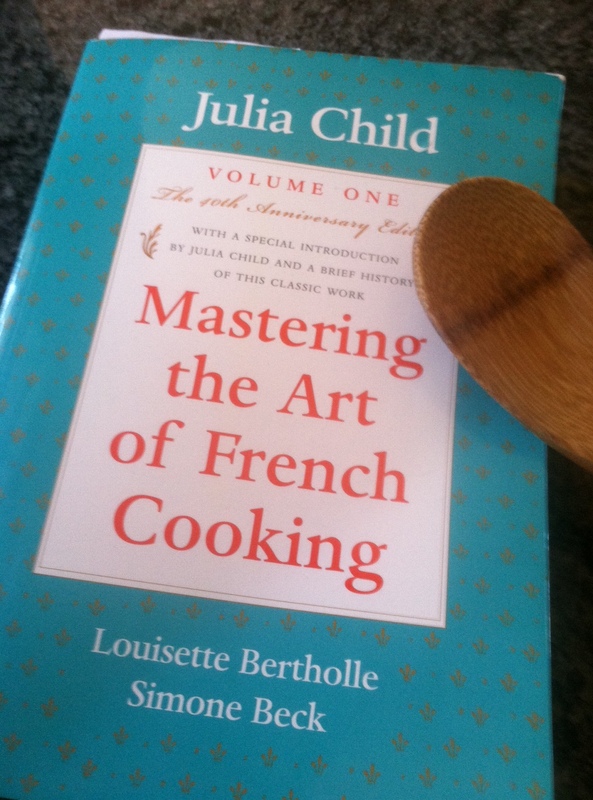 With most french cooking, you must be willing to follow the directions, exactly as they are written. This soup took a good 3 hours from start to finish. Most of the time was spent simmering the soup. 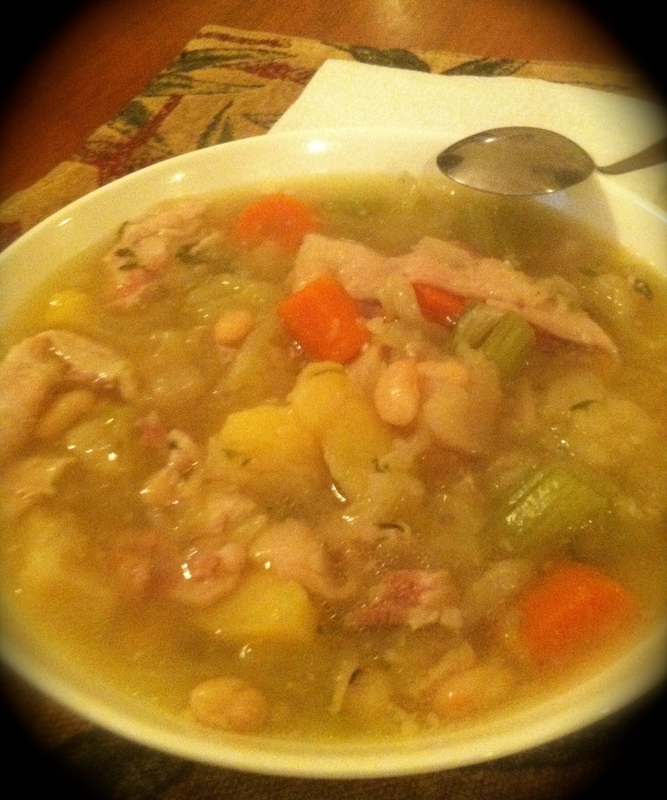 I added turnips, celery and white beans in ours, that the recipe gave as an option. 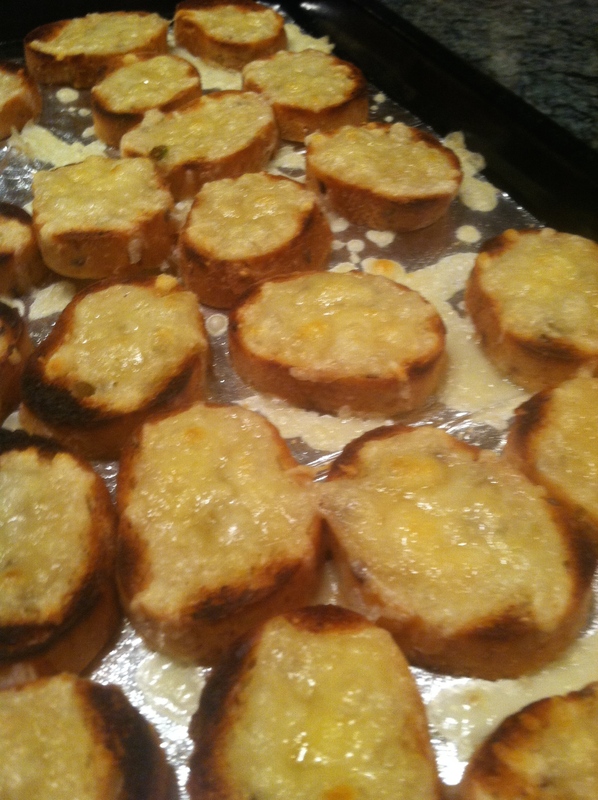 Once the soup was done, I made up some cheese crouts to dunk into our bowls, which I promptly left under the broiler, 30 seconds too long. If you like the Irish dish of corned beef and cabbage, you are going to fall in love with this soup. Hearty and filling. This is definitely one that I will make again. Place the water, potatoes, and meat in the kettle and bring to boil. Add the cabbage and all the other ingredients. Simmer partially covered for 1 1/2-2 hours or until the meat is tender. Discard parsley bundle, bay leaf, and cloves. Remove the meat, slice it into serving pieces, and return it to the kettle. Correct seasoning. Skim off accumulated fat. If not to be served immediately, set aside uncovered. Reheat to simmer before serving. Serve in a tureen or soup plates, accompanied by the bread.